Some background on my stoic exercises. I took part in Stoic Mindfulness and Resilience Training, an online course from Modern Stoicism as part of the Stoicism Today project, back in May & June earlier this year. It was a four week course that walked through some introductory principles of Stoicism along with daily and weekly exercises. The course was an expanded version of Stoic Week, which I originally participated in during 2013. I enjoyed the course, the instruction was clear and well organized and I did a decent job sticking with meditations and daily exercises throughout the four week duration. A chart representing a trend over time of how many times per day I felt angry. Right now I’ve tracked 103 days with an average of 2.6 reports per day. I often wake the app, answer the first survey and then miss or neglect prompts throughout the day. On weekends I often miss waking the app at all. I don’t feel guilty or give myself a hard time for the lack of consistency; instead I simply treat the exercise as an attempt to build mindfulness. This app has become a useful tool to help trigger moments of mindfulness and supports my ongoing stoic practices. It’s remarkably difficult to answer the question “what are you thinking?” when you’re asked spontaneously throughout the day because it is so easy, in the run of a day, to operate on auto-pilot and simply react to all of your stimuli. The point is, by actively trying to define my current thoughts I will become more aware of my thoughts in the moment and eventually identify potential negative thoughts before I react to them. My intention with data tracking is to measure the effectiveness of Stoicism—or any other way I try to improve my life—and make adjustments as needed. So far this has proven fairly effective and I’ve seen an increase ability to cope with daily stress and a decrease in anger outbursts caused from stress. 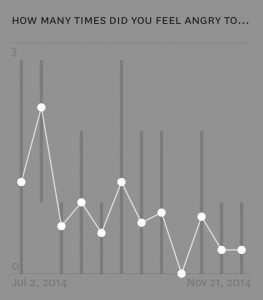 From July 2014 to November 2014, for example, I have seen a steady decline in the number of times I’ve felt angry per day. That’s enough proof to me that Stoicism is effective and to continue exploring how it can improve my life.